InventHelp’s INPEX® 2013 was held June 19-21, at the beautiful David L. Lawrence Convention Center, in downtown Pittsburgh, Pennsylvania. This was the 28th INPEX, which featured more than 1,000 inventions and new products on display for review. This year’s keynote speakers were Reichart Von Wolfsheild and Scotty Ziegler, hosts of History Channel’s popular show Invention USA. Scotty and Reichart spoke to inventors about the hundreds of products they have created for big name companies. Many exhibitors also had the opportunity to meet with Scotty and Reichart during an inventors networking event that took place the first evening of INPEX. This event gave inventors a valuable opportunity to meet with their peers and support one another. “The INPEX show was great. The staff did a wonderful job. The experience was more than I could have imagined. The contacts and exposure were unbelievable,” said Lois Leonard, exhibitor and creator of Get-A-Grip Chafing Pans. Many media outlets were present at the show. Pittsburgh Radio station 1410 AM KQV, WPXI, Pittsburgh’s NBC affiliate, The Pittsburgh Post-Gazette and The Pittsburgh Business Times were among the news outlets that conducted interviews with Trade Show Director, Nicole Hait as well as highlighting various inventors and business attendees. Exhibitors also had the opportunity to attend INPEX® Inventors University™ featuring presentations from industry experts such as Karen Waksman, Founder and CEO of Retail MBA and Lisa Lloyd, New Business Development Specialist for Lloyd Marketing Group, Inc, as well as many others. Topics included many inventor-related subjects such as selling to retail, website development, and direct response television. Another highlight of INPEX® included private product searches and reviews conducted by various companies throughout the three days of the show. This year, the companies in attendance included, Kraft, Sky Mall, Schroeder and Tremayne, Irwin Industrial Tools, Reckitt Benckiser, Rubbermaid, EB Brands, Hampton Direct, Plews & Edelmann and Danco. InventHelp and INPEX will soon be announcing the dates for INPEX® 2014. 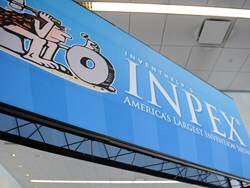 For more information about the upcoming INPEX show, please visit InventHelp’s INPEX® website: http://www.inpex.com or call 1-800-54-INPEX.